Winifred Barclay died in 2004 aged 95. 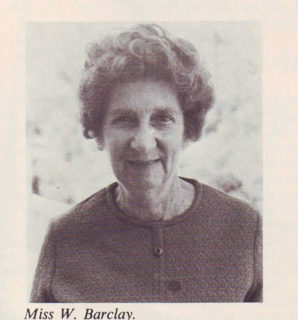 She was the Head of Mathematics at MLC between 1964-1977. Her father, the reverend Arthur Barcaly, was largely credited with encouraging the school to establish the boarding house for country students as he recognised the need for women to be provided with a sound education. I was born in Bagot Road, Subiaco. My father was the Methodist Minister at the Subiaco Church and I was born in the Manse. I had three sisters and two brothers. I went to Thomas Street State School, close to Modern School, to the end of primary school and after that to Methodist Ladies' College. 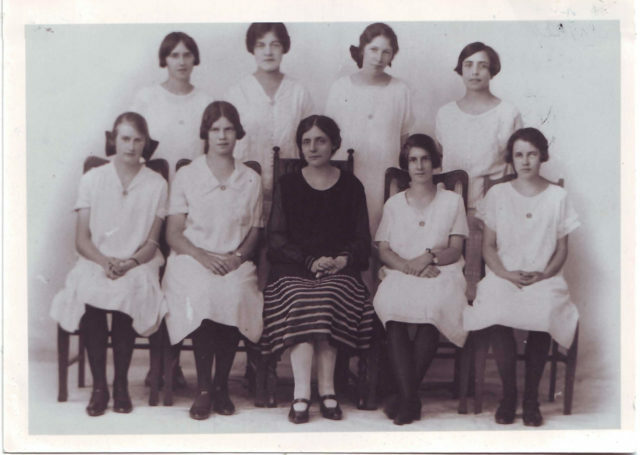 Dorothy went to MLC in 1912. From then onwards I was always conscience of MLC. We lived in Albany in those days. Father was the Minister of Albany. When he came out of work with the parishes he took over, fulltime, at MLC. We came up to West Perth. That was 1913. The school was his baby. Dorothy was there for four years. She was very bright. Marjory and Olga went for two years. I was there for five, commencing in 1922. In 1918 we moved to West Leederville in to a home owned by my parents, it was no longer the Manse. I took the train to school. In the Sub-Junior Class we did English and Maths, History and Geography, Biology, Physics, French and a bit of Latin. There were no free periods in those days. I was extremely fond of my Form Mistress. I was pretty much in awe of the first assistant who used to take us for French and Latin. We loved Miss Dixon, she took us for Biology. The school was small so we all had a lot to do with Miss Walton (the Principal). She loved the little ones. A firm friend I made was Betty Hope. She sat behind me in the Sub Junior Class. She started the same year. I was a day girl for two years, then a boarder for three years. I made another group of friends when I went into the boarding house. It was good for me as I was very much the younger sister and I learnt to look after myself. MLC has always been a part of me, shall we say. Father had been involved from before the time I was born. It was always there, a part of my life. And even though I've not been a good Old Scholar, I've always been interested and was glad when the school went well and sorry when it didn't.